I do love making Brooches. I now have more designs available for Crafters ... 6 'Bird' designs pack and 3 'Girl' designs pack...all hand printed onto a choice of 100% white cotton or calico. Ideal for patchwork, embroidery etc. I will be printing onto purchased plain cottons in the future, as I have run out of vintage fabrics from my own personal collection. There will, however, be the odd vintage pieces here and there when I can source appropriate fabrics. 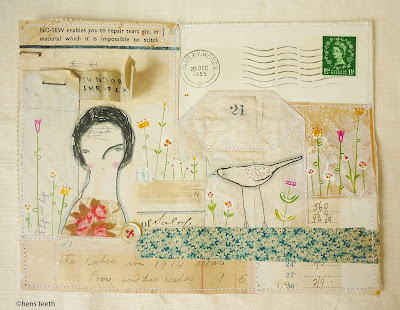 printing on vintage and newer fabrics. recent works, all based on beautiful, old envelopes. A real challenge to stitch and work around the interesting writing, type and stamps, but thoroughly enjoyable.